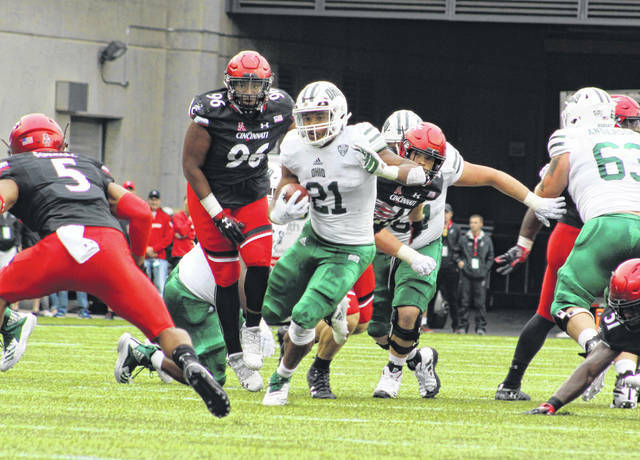 Ohio running back Maleek Irons (21) breaks through the line of scrimmage during the first half of Saturday’s non-conference football game against Cincinnati at Nippert Stadium in Cincinnati, Ohio. 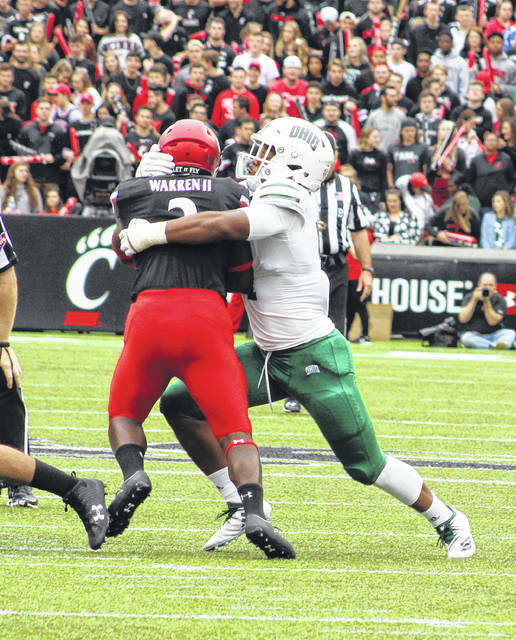 Ohio defensive lineman Will Evans wraps up Cincinnati running back Michael Warren II for a tackle during the first half of Saturday’s non-conference football game at Nippert Stadium in Cincinnati, Ohio. CINCINNATI, Ohio — A tale of two halves. 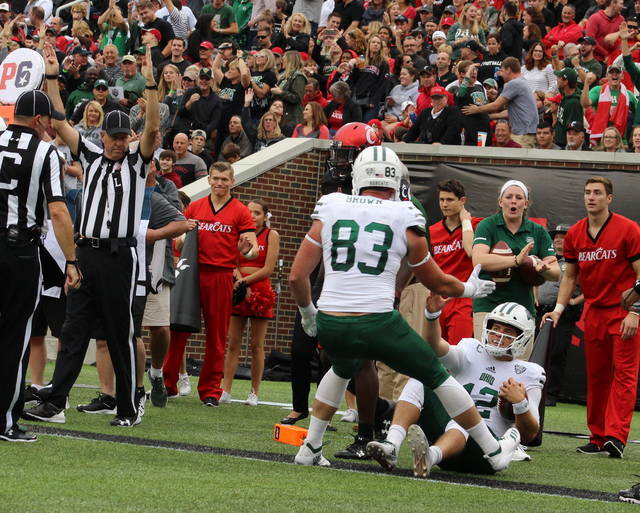 The Ohio football team stormed out to a 21-point advantage early in the second quarter, but host Cincinnati rallied to take its only lead with 3:24 left in regulation and ultimately held on for a 34-30 victory on Saturday in a Week 4 non-conference gridiron matchup at historic Nippert Stadium in Ohio’s Queen City. The Bobcats (1-2) were dominant in the first half as the guests held the Bearcats (4-0) to just 131 yards of total offense while securing a comfortable 24-7 intermission advantage. 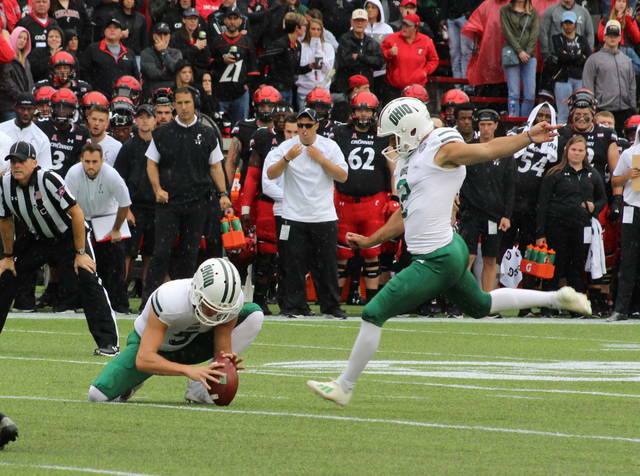 UC, however, held the Green and White to just two field goals after the break and managed to put together a pair of touchdown drives in each of the final two quarters, including the go-ahead score with under four minutes remaining. OU responded with a 6-play, 71-yard drive that left the guests facing a third-and-goal at the Cincinnati four, but Nathan Rourke’s pass attempt to Papi White was picked off by James Wiggins — giving the Red and Black possession at their own two with 52 seconds remaining. The victory allowed Cincinnati to not only match its win total from a year ago, but the Bearcats also took a 24-23-4 lead in the all-time series. It was also the first meeting between the two programs since 1981. UC has also won seven of the last eight head-to-head matchups, with the Bobcats’ last win coming by a 27-7 margin at Nippert Stadium in 1979. After a pair of listless opening drives by both teams, the Bobcats caught the first break as a roughing the kicker penalty put new life into a stalled drive at the Ohio 41. 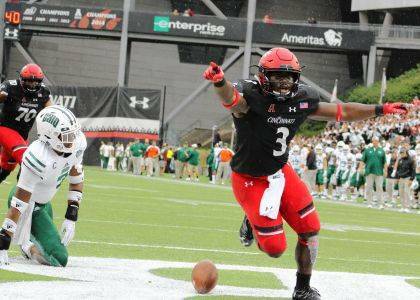 Cameron Odom hauled in a 38-yard pass, then a personal foul moved the ball to the UC nine. Two plays later, A.J. Ouellette capped the 7-play, 84-yard drive with a nine-yard run at the 8:40 mark, giving the Bobcats a 7-0 advantage. 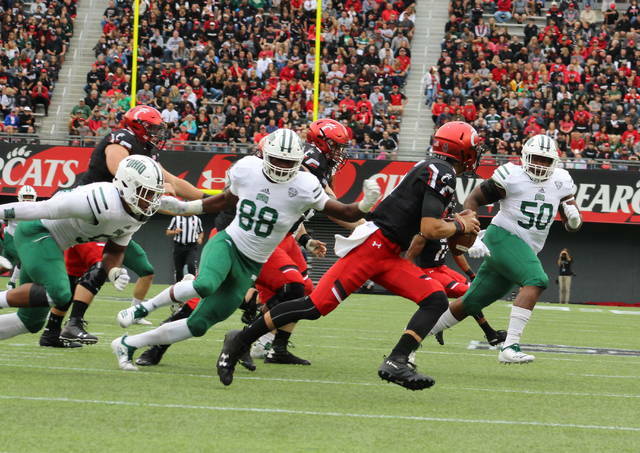 After forcing a Cincinnati punt, Ohio strung together a 10-play, 64-yard drive that resulted in points as Maleek Irons took a swing pass from Rourke and went untouched for 12 yards while increasing the lead to 14-0 with 23 seconds left in the opening canto. The Bobcats forced another three-and-out, then put together a 7-play, 51-yard drive that gave the guests their largest lead of the game. Rourke scrambled and made a cutback move to score from three yards out with 11:12 left in the half, giving OU a commanding 21-0 cushion. At this point in the race, Ohio had produced 199 yards of total offense on four drives and 27 snaps. The Bearcats, conversely, had mustered only five yards of total offense on a dozen plays over the course of three drives. And, on its fourth offensive possession, Cincinnati absolutely hit rock bottom on its first snap as Ohio’s Jamal Hudson picked off a Desmond Ridder pass that gave the guests the ball at their own 46. OU was forced to punt the ball back, and the Bearcats found some rhythm by stringing together a 9-play, 80-yard drive that led to points. Michael Warren II capped things with a 24-yard scamper at the 5:44 mark, trimming the deficit down to 21-7. The Bobcats countered with an 11-play, 73-yard drive that resulted in a successful 25-yard field goal by Louie Zervos, allowing the Green and White to secure a 24-7 lead with 30 seconds left before the intermission. At the break, Ohio owned a 15-8 edge in first downs, a 236-131 advantage in total offense and were plus-1 in turnover differential while still holding a three-possession edge. 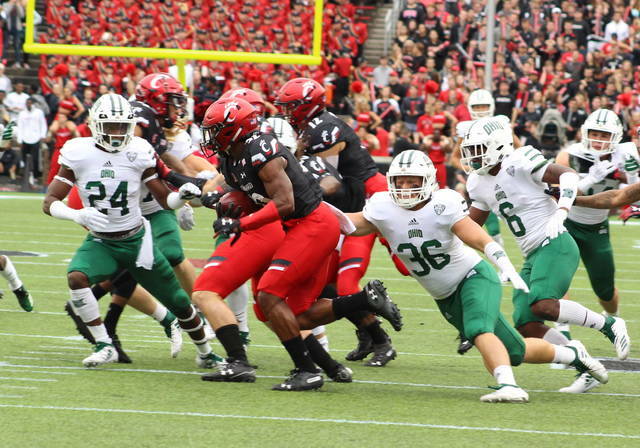 The Bearcats, however, started the momentum shift with their opening drive of the second half after covering 75 yards in only three plays. Ridder found Rashad Medaris on a 77-yard scoring pass at the 13:42 mark of the third, trimming the deficit down to 24-14. Both teams followed with three-and-outs, then OU marched 44 yards in seven plays to add a Zervos 33-yard field goal for a 27-14 lead with 8:38 left in the third. Cincinnati pinned Ohio inside the two with a punt on its ensuing drive, but the hosts got the ball back two plays later as Papi White had the ball stripped away. Derrick Forrest recovered the ball for UC at the Bobcat 28. 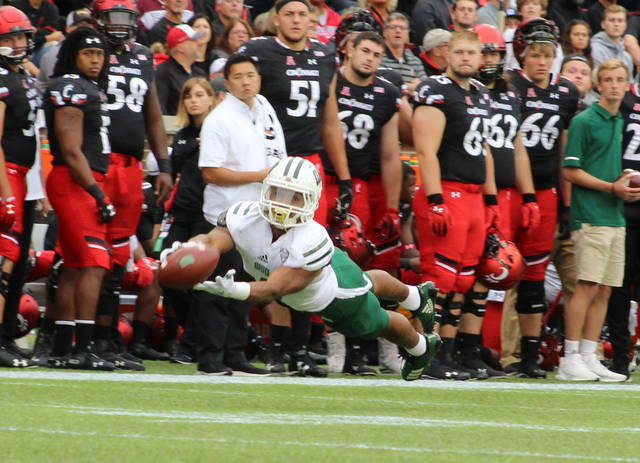 The Bearcats needed four plays to cover the distance as Ridder scrambled seven yards to the front left pylon for a 27-21 contest with 1:25 showing in the third. The Bobcats answered with an eight-play, 28-yard drive that again ended with a successful 47-yard field goal by Zervos, making it a 30-21 contest five seconds into the fourth quarter. Cincinnati needed only five plays to cover 71 yards as Jayshon Jackson hauled in a 26-yard pass from Ridder, making it a 30-28 game with 12:37 left. The Bobcats put together an 8-play drive before punting the ball away, giving UC possession at its own eight with 8:26 remaining. The hosts marched 92 yards in 13 plays while only having to convert one third down play, and Warren II gave UC its first lead with a three-yard run at the 3:24 mark. The Bobcats covered 71 yards in six plays while trying to reclaim the lead, but White and Wiggins got their legs crossed up during Ohio’s final offensive snap. White fell to the ground and Wiggins went on to pick off the pass that ultimately sealed the outcome. Cincinnati finished the game with a 424-412 edge in offensive yards and also ended up plus-1 in turnover differential. Ohio, conversely, posted a narrow 25-24 cushion in first downs and had one fewer punt in the setback. The Bobcats churned out 234 rushing yards on 45 attempts, with Rourke leading the way with 96 yards on nine carries. Rourke was also 12-of-27 passing for 178 yards, throwing one pick and one TD. Ouellette added 71 yards on 21 carries, while Irons had 64 yards on a dozen attempts. Cameron Odom led the wideouts with five catches for 114 yards, while White (23 yards), Irons (20) and Andrew Meyer (15) each collected two passes. Javon Hagan paced the Ohio defense with 11 tackles. Jared Dorsa also recorded seven stops for the Bobcats, who did not have a sack in the setback. Warren II paced UC with 124 rushing yards on 23 carries. Ridder was 19-of-29 passing for 274 yards, throwing one pick and two TDs. Medaris hauled in three catches for 104 yards. Jarell White and Bryan Wright both recorded nine tackles apiece for the hosts, who were penalized 14 times for 150 yards. The Bobcats, who held possession for 35:22 of 60 minutes, were flagged eight times for 85 yards. Ohio — which has allowed at least 31 points in each of its first three games — hosts Massachusetts at 2 p.m. Saturday.